I haven’t devoted any time/effort/code to the extraction and parameter estimation of arterial input functions (AIFs) for DCE-MRI in either the vignette or the submission to JSS. Frankly, I wanted to communicate the main features of the R package dcemriS4 and data-driven AIFs just haven’t made the list… up ’til now. 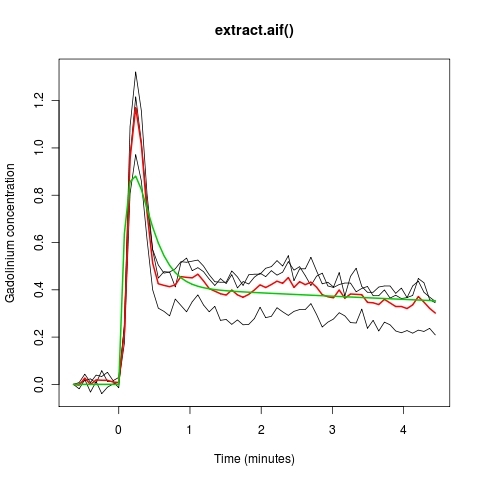 So let’s assume one wants to fit a parametric model to observed contrast-agent concentration time curves (CTCs) obtained from a DCE-MRI acquisition. The thin black lines correspond to individual CTCs from the voxels, the red line is the average CTC used to fit the parametric model and the green curve is the fitted model. Note, in order to fit the entire time series a compromise was struck between fitting the first pass of the contrast versus the tail. It may be necessary to modify the range of acquisition times in order to emphasize the beginning or the end of the AIF, depending upon which aspect of the dynamic acquisition is more important. Contrast-agent concentration time curves from voxel (128,75,9).